Here's where things start to get exciting. We have data in a database, and you built up all of this knowledge about PHP and you know how to work with data in a lot of ways. We haven't connected with a database yet, but you've worked with CSV files, you've worked with arrays, and all of the concepts that apply to that type of data also apply to databases but you get some extra benefits too. In fact, it can make some things a lot simpler than before. But before we can use this data, we have to connect to the database in our PHP script, so that's what our next step is. Let's go to our resource pack directory and in the fourth folder, it's called MySQL_databases and PHPMyAdmin, we're going to open up the first step here which is called test dot php connect to mysql and query. Also, if you don't have it open already, let's open the test dot php file from our examples folder. So we'll hop over there and open up test dot php. Let's copy over the code from our step file and paste it over the code that's in the test dot php file and save it. Now, if you're using Acquia Dev Desktop, then these settings should work just fine for your installation. However, if you went some other route, then the user name and password information for this mysql_user might not be in line with what's in your installation. Now, we'll get to more of that in a moment, but I just wanted to explain why this might not work immediately on your machine. Since, we've copied over the code in test dot php, let's demo what happens here. I'm going to go back to the browser, and I'm going to go to test dot php and hit enter. And what I'm seeing here is each record in the database displaying information about the rows and about each of the column names and the data associated with each of the names. Here's George, here's Sally, and here's Deepak. Now, let's look at the code that makes this happen. So I'm going back to my editor, and the first thing we're doing is using a function called mysql_connect(). Now, for most of the videos on BuildAModule, we use mysql and the majority of Drupal sites out there also run on mysql. And so the reason that we have this mysql prefix on this function is because there's other databases for which there are these same functions when we're trying to connect to them with PHP. Mysql_connect() is a PHP native function. 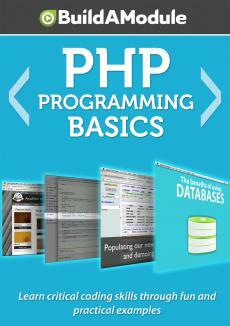 It comes bundled with PHP just like some of these other mysql functions that we see here. Now, just as a quick heads up, Drupal puts another layer on top of these functions so you won't actually use them directly when you're working with Drupal, but it's important to have an idea about what's going on behind the scenes, and occasionally there may be an instance where you want to run a query directly. Okay, so mysql_connect() is a function that we use to tell PHP that we want to start using mysql.